Canadian Wildlife Federation: Can’t we just clone endangered animals to stop them from going extinct? Can’t we just clone endangered animals to stop them from going extinct? A. The technology surrounding cloning has been advancing since 1996. This was when Dolly, a female Finn-Dorset sheep, the first mammal to be successfully cloned from an adult cell, was born. This spurred many more attempts to clone other species, with most clones living only minutes or days after birth – at least in the beginning. Since then there have been many advances and successes with both domestic and wild species. Cows, for instance, are often cloned for their meat and pigs for drug tests. Since the mid-2000s, domestic cats have been used as surrogates for African wildcat clones with healthy individuals living into adulthood. European Ground Squirrels were reintroduced into their natural habitat in Slovakia. Today, the success rate for cloning is about 10 percent, although this varies depending on the species and the cell type used. Now there are researchers looking to clone the Wooly Mammoth after scientists found a bone from a frozen individual. By inserting a nuclei from the mammoth cells into egg cells from an elephant, their closest living relative, they’re hoping to resurrect this extinct animal. Fast forward about 20 years, since Dolly, and the arguments for and against cloning or de-extinction seem to be very much as they were back then. Some people say cloning will discourage zoos and researchers from using wild animals for their studies, that cloning could help save endangered species or stabilize a shrinking population, that we have an obligatory right to bring back species that we drove to extinction, and that by bringing back extinct species we could also be bringing back their ecological services. Others say cloning doesn’t address the reasons for why the species went extinct in the first place. With limited genetic material individuals would be a genetic photocopy of each other after only a few generations. Many are concerned that with habitat loss being the main reason for animal extinction, there would be no place for these cloned animals to live other than in zoos. Moreover others raise the question whether cloned individuals can learn their appropriate behaviours from their foster parents which are often a different, although similar, species. And will cloning trivialize the seriousness of extinction? 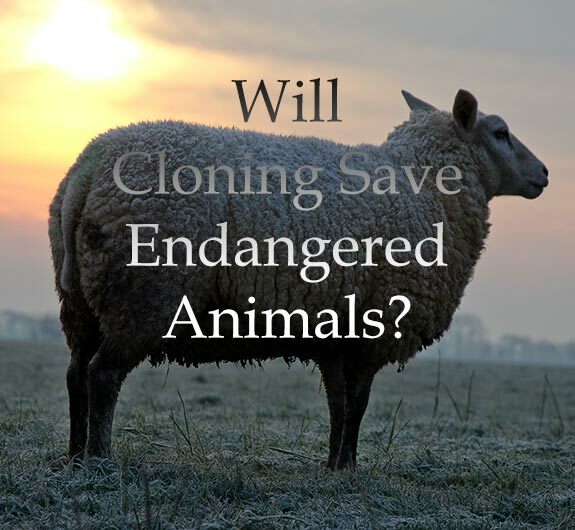 Will cloning take money away from the conservation of habitats and biodiversity? There are so many thought provoking questions that need answers. With the cloning debate very much alive, it will be interesting to see what happens in the next 20 years.